When Zelda II first came out, most people weren�t quite sure what to make of it, since on the surface of things it was completely different from the original Zelda. I wasn�t either, having plucked it and Final Fantasy from a bargain bin sometime around �94, but it wasn�t entirely alien to me since I had played other RPGs by that point. My late arrival gave me a different perspective than a lot of NES fans. The Zelda games arrived before most NES RPGs, which may be one reason people felt so sour on Zelda II until Ocarina of Time? brought out the promise hiding within its clunky design. A lot of resentment toward the game is directed at the three lives and experience reset system, which don�t mesh well with dungeons full of life-stealing pits and deadly Iron Knuckles, but that�s more a modern complaint about the limits of late �80s game design than anything else. Having played Zelda II back when the NES was still viable, the one thing that stood out to me more than the lives was that it lacked an obvious sense of structure. One of the greatest strengths bandied about in the 3D Zeldas is the sense of exploration and finding things, and that�s no less true here as well. 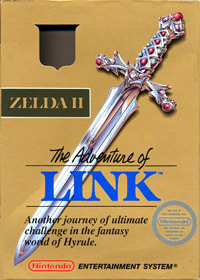 The difference between Zelda II and its sequels is the obvious structure that runs throughout the later games. At the very least, they�re good about pointing the player in the general direction of the next major objective, which is something that Zelda II and its unhelpful NPC hints fail at. It�s a divisive point; fan reaction to the increased linearity and child-friendliness of the later games has been largely negative, and there�s a lot to be said for the freedom to explore at will. Still, the combination of that freedom and the stark limitation of the lives system isn�t the smartest of pairings.